The damage to the historic fabric of Ludlow is almost as old as the buildings themselves. The damage has got worse over the years as permitted lengths and weights for HGVs have increased. 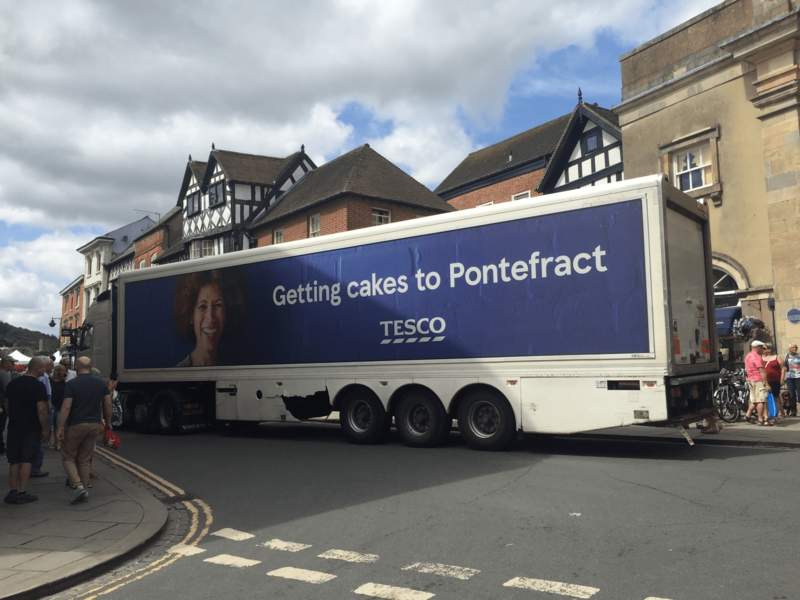 But if you want to get Cakes to Pontefract, a current Tesco slogan, the best way to do it is through the centre of Ludlow. That moving advert for Tesco has slightly damaged a bollard with more significant damage to the truck. I am lost for words here. Tesco has been a world leader in gathering computerising information on customer habits. It ensures its shelves are restocked the moment they empty. But it seems they don’t know where their stores are. Satnav anyone? A paper map? Or perhaps a Tesco mobile phone will help. It is only a couple of years since a truck delivering tarmac to resurface the car park at Tesco bashed Ludford Bridge, costing council taxpayers tens of thousands of pounds. 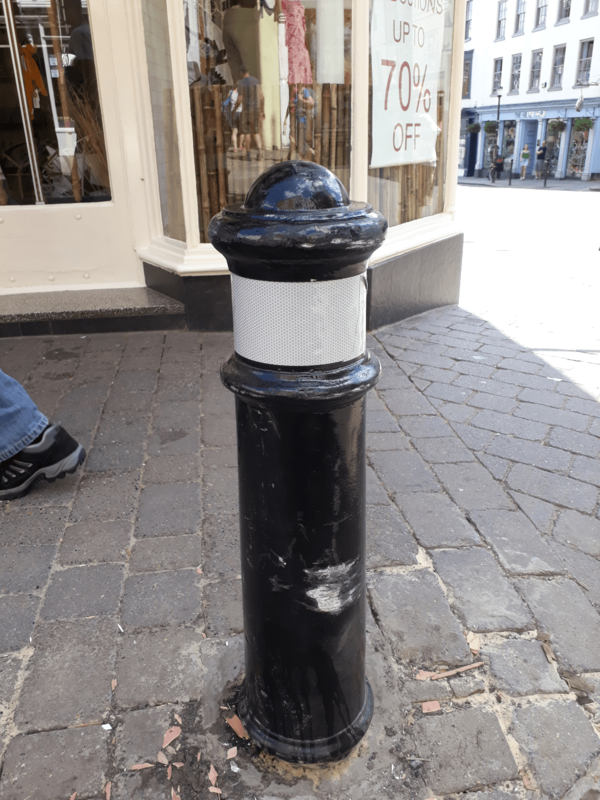 At the beginning of this week, the bollard outside Bodenhams was demolished by a truck. I take my hat off to Shropshire Council for a quick replacement. Bodenhams is Grade II* listed and the Buttercross is right at the very top, Grade I. Fortunately, neither building was damaged. 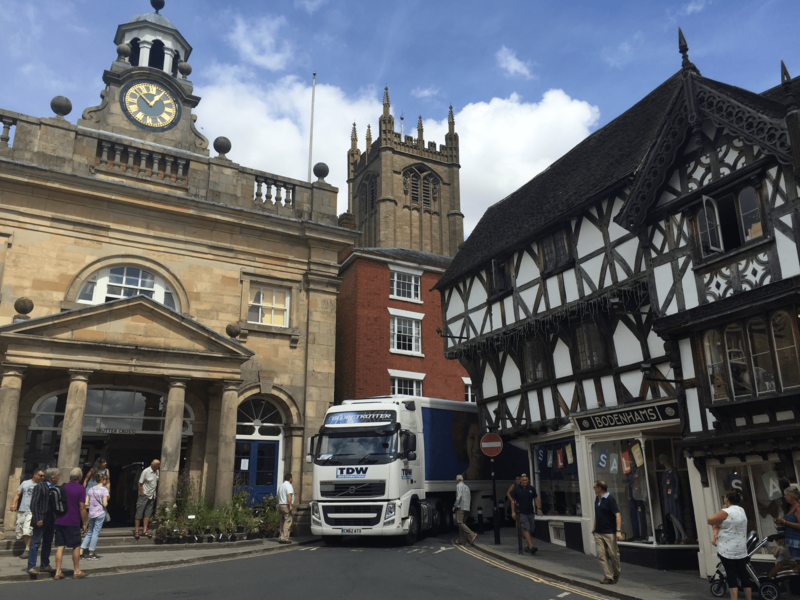 Thankfully the bollard was back up by Saturday when a truck being driven by TDW Distribution failed to negotiate the Buttercross chicane and had to shuffle back and forth. The damage to the truck in photographs taken by residents is evident. It shows the folly of not knowing where you are going when you are contracted to one of the biggest companies in the UK. The new bollard is substantial enough to take a Tesco truck full of Pontefract Cakes. But the scrape on the bollard can be seen. I can only guess that these drivers are issued with a paper map or no map at all. Otherwise, how do they get lost? Or perhaps it was a satnav error, some systems seem to direct drivers through the Broadgate. I use an app on my mobile phone to find my way in unfamiliar territory. Ironically, I have a Tesco branded mobile phone. Maybe we should have a whip round to buy a mobile phone so that their delivery drivers can find out where they are going? There is a broader issue. We have oversize trucks serving Ludlow. This truck was owned by a company in Bridgend, where Tesco has a distribution centre. The driver should have known where he was going. We have problems with the One Stop delivery trucks also. They block access for residents on Tower Street. They cause a safety hazard on Gravel Hill delivering to that store. Tesco, which owns the One Stop chain needs to get its act together. It must ensure its drivers support the interests of our town as well as its shareholders. I don’t take any excuses about “it’s a contractor’s vehicle”. If a company has stuck its branding on the side, then it carries the can for everything that happens in its name. My thanks to residents who passed on the photographs. Perhaps certain towns should be allowed to introduce local length / width / weight restrictions? I have asked for a review of the case for a weight restriction. However, the experience on Lower Broad Street is that drivers ignore them and head for the Broadgate anyway. They also ignore the satnav error signs the other side of Ludford Bridge. I will report the outcome of the review when I have it. Many officers are away so it may be a couple of weeks. A friend who comes on the coach to Ludlow from Nottingham each May was always dropped by the bus stop in Mill St. Until this year when the driver announced he would not go into the centre of town and dropped them all off at the Smithfield. He didn’t explain exactly why but asked them all to come back there when it was time to go. When he dropped them off he was berated by a Ludlow woman who complained that it was too far for old people to walk up into town and he would discourage tourists from visiting the town! What a mess. It is beyond reason for drivers of huge lorries to attempt to go through King Street, it so often ends in utter disaster. I suppose i am too innocent to believe that King Street should be made Pedestrians Only. Ok, i can hear the laughter…. It says a lot for the ability of these pedestrians to nip out of the way of Cars, (the lorries make their prescence felt all too easily!!!) I have had several near misses myself. Can we at least have SLOW signs? Please.